It may be April, but as everyone who lives in Boston know, it can be May and we still might get a foot of snow on the ground. Well today was no exception, as the weather played a cruel, surprise belated April Fool's snowstorm joke in Boston, when the white flakes began to fall this afternoon. Luckily for me, it quickly turned over to rain, as I was driving to Avalon to see The Jagermeister Tour. What goes better with metal than Jagermeister? Tonight the two forces combined featuring the top new bands in metal that are making a name for themselves through consistent touring which included, Stone Sour, Lacuna Coil, and Shadows Fall. We really should have named today in Boston Lacuna Coil day, as the band took over Boston with a vengeance. Lovely Italian Goddess Cristina Scabbia and company started the day performing on Fox 25 Morning news. Lacuna Coil is famous for their spellbinding melodic melodies. As the band make their way down Mass Ave, what better way to showcase their talent than to perform an acoustic set at Daddy's Junky Music in Boston. After a busy day in Boston, Lacuna Coil set their sights on performing to a sold out crowd at Avalon. I was looking forward to hearing the band perform. Last time I saw them in a club setting was on the sold out Rob Zombie tour. Avalon is the perfect venue to see a concert. The club has great acoustics, and not a bad seat in the house. Lacuna Coil had the honor of kicking off the show and hit the stage at 7:30 P.M. to perform a set that featured many songs off their latest hit album, Karmacode on Century Media Records. Opening with, “Closer”, Cristina held the audience spellbound with her flawless performance. It so inspiring to me to see a woman in metal that is making such an impact in music today. One of favorite songs was “Heaven’s A Lie". I really enjoyed the balance between the two lead singers. Andrea Ferro also has an amazing voice that blends so well with the melodic vocals of Cristina. Combined the two driving forces, make Lacuna Coil a driving force. Lacuna Coil has a unique sound that combines metal, melody, and great lyrics. Another highlight included their new single, “Within Me". The song has a great acoustic intro and ballady kind of feel to it. Lacuna Coil ended the set with the rocking, “Our Truth”. I loved the orchestration of this song. The song has a larger than life appeal, with powerful vocals, and blistering guitar work. Lacuna Coil has that real, honest approach that transpires into their music. If you get a chance, I highly recommend checking them out on the Jagermeister Tour. Lacuna Coil will be embarking on a headlining North American Tour, which is slated to begin right after the Jagermeister Tour wraps up in May. Boston is fasting becoming the breeding ground for a lot of hot, new metal bands. Shadows Fall made their triumphant return to Boston tonight. Earlier today, Shadows Fall did an in-store appearance at Best Buy to promote their new album, Threads of Life that was just released April 3rd. Shadows Fall hit the stage at 8:30 P.M. and literally destroyed the room with a brutally amazing performance. The very dread-locked Brian Fair, whose hair these days reaches his feet, drove the crowd into frenzy. It was so exciting to see the band performing new songs from Threads Of Life. Most new tunes take a while to break in, but not tonight. As Shadows Fall jumped into the new tune, “Venomous", this song sparked the theme for tonight. Dangerously powerful, and deadly like a snake, Shadows Fall death-thrash-metal took on a whole new meaning. I really enjoyed how the new tunes also have a melodic appeal. Guitarist Matt Bachand blends his perfectly melodic vocals to Brian’s growling howl. Shadows Fall also played the song from the Guitar Hero game, “The Light That Blinds". The band sounded tight, and ready to destroy Boston. Mosh pits formed everywhere as Shadows Fall unleashed their fury. Front man Brian Fair said, “It feels so good to be home. I am standing in the threshold of Fenway Park. Did anyone tell you that tonight's concert is a party? We have tomorrow off, so we are not leaving. I am really tired of music today. Only the fans can change metal, and bring it back." It seems to me that Shadows Fall is bringing old school metal back, combined with a death metal approach. The band ripped into the song "Redemption". The guitars of Shadows Fall featuring Jon Donais and rhythm guitarist Matt Bachand were a brutal onslaught of death metal riffs. Drummer Jason Bittner pounded the drums with a fury. Shadows Fall has to be one of new favorite live bands. I really enjoyed the new material most of all. I am looking forward to a longer set, when the band can play more tunes on a headlining tour. I recently had the opportunity to discuss with Matt Bachand how the Boston music scene has grown. Matt told me, “Shadows Fall first got together in 1996. The scene has definitely gotten bigger, since when we first got started." I also asked him, if he was a big 80's fan. 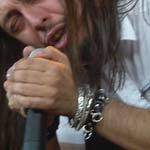 Due to the fact that Shadows Fall covered the Dangerous Toys tune,"Teasin' Pleasin’” on their last album. Matt said, “Definitely. I think everybody is. It was a fun time. We had some songs laying around, and we wanted to do something with them." I was unable to see Stone Sour. I had to get an early start to fight my way home through the bad weather. For a long time, the Boston metal scene has been dead. But once again Boston and various cities across the country will get to see this new breed in metal today. Bands like Lacuna Coil and Shadows Fall, who are going back to their roots, carving a niche in metal that is real, honest and identifies with music fans of this genre.